Three Alternatives when you Compress PST are Remove attachments, Extract and Save attachments, Extract, Save and Compress attachments. Marvelous characteristics of Software to compress PST files! An oversized PST file is a big concern as this head to corruption with Outlook PST Compress tool; you can compact or reduce the size of PST file easily and make it manageable. Software will extract and save the attachment as per your requirement. Three different options to compact Outlook PST file. This program keeps the entire meta data intact & safe like; date of sent/received email, attachments, Cc, To, Bcc, sender's ID, etc. This option compact PST file size without deleting the attachments, as it extract attachments from PST file and restore them in separate folder. You can find Outlook PST file compress to a large extent with entire attachment saved in a distinct folder. This option extracts and save the attachments of Outlook data file, besides this compact the size of attachments by zipping them. Software does not affect the original PST file info stored in it like e-mail, attachment, sender info, date and time etc during the process. One the process of PST file compression started, software will create a complete export report that includes details like, name of PST file, folder, number of mails and attachments found and so on. It works with all MS Outlook editions 2013, 2010, 2007 and 2003 etc. To start PST compress process users need to add PST files/folders, from the system and select desired location where they want to save compress PST files. After selecting the desired location click on compress PST and software provides 2 superior alternatives to Compress PST files from which you can choose the desired one. After choosing the require option click on Compress button to reduce the size of PST file. Download free trial pack of software quickly and get complete info about how to compress PST files. 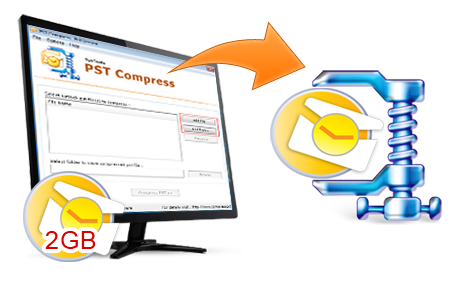 Users will compress first 5 PST files per email folder by using free pack of Compress PST software. Here is Online Software Working Video to Learn How to Compress PST Files!! With the help of this video user will get complete info about working process of software and Learn how to compress PST files with the help of this effective tool. If After watching this video you think software can full-fill your need, then invest a reasonable cost for its full edition to reduce PST file size and save PST data from the corruption issues.